- PIC32MZxxEFxx MCU. Is there any problem with it? Compared to EC series it seems to have fixed some nasty hardware bugs. I don't believe the EC will be ever fixed (just like dsPIC30F6012 was never really fixed, but reworked and released as new device), so there is no point in sticking with it for new designs. Hardware floating point unit will not hurt either. - some kind of networking. What to use? LAN8720 and wired ethernet? What about wifi? There are builds for Wifire board, does it utilize the wi-fi module? ESP8266 seems to be popular in hobby segment too. - USB/serial converter attached to USART. This is just handy and allows serial bootloaders to be used. - USB host? Can we utilize USB host in any way? - RTC. Can we utilize RTC? - 10x5cm space, to fit low-cost chinese PCB suppliers. - I'd like to manufacture a few boards and distribute it to folks in this forum. 256M ought to be enough but 512M would be better. Do we still need the pic32mz on the board then? Does that chip have an MMU? IoT does not need MMU..
ESP32 can work (except its wifi or bt function) as a realtime coprocessor (doing some useful work, under rtos), and the RetroBSD (or LiteBSD when mature) can work as a presentation or UI layer.. Probably 2x Tensilica L108 CPU - see pdf brief. IoT may not need MMU, but LiteBSD does. Without that it will only ever be a peripheral to the PIC32MZ core processor. Exactly. As a realtime coprocessor. I agree with you. An OEM board using MZ...EF looks interesting. And I would be happy to help . Most folks seem addicted to Arduino 'bus' and form factor. I think there are better ideas already out there! MMU is clearly needed, but I have yet to see it work. I do have an MZ...EF board, but really want to read and store what is in its flash before I start to fiddle. MZ looks like a pretty well thought out product from what I see so far. So the MZ...EF is probably good to start out with? - PIC32MZxxEFxx MCU. Is there any problem with it? Compared to EC series it seems to have fixed some nasty hardware bugs. - etc... by 8 eur on 1k really seems pretty good. - regarding the memory - it is not trivial or cheap to add much memory. It is easy to add SRAM, which is quite expensive (few bucks per MB). On the other hand, it is not easy to add SDRAM, which is cheap (few bucks per 128MB). On retrobsd I had up and running SDRAM bitbanged bus, though the bitbanged interface contains some magic sauce in MIPS assembly by madscifi I don't comprehend for 100%. - defintely no Arduino form factor. The only good thing about Arduino compatibility are cheap expansion boards (no way I'm gonna call it shield), but those are often designed for 5V and honestly - it is usually trivial hardware and I can't think of any that would be worth the work. - what about the RTC, Ethernet via LAN8720, wifi or USB host? Any ideas about it? I think the Retro community shall first decide/think where the pic32mz with LiteBSD shall be actually positioned, and who are the potential users, and what kind of problems it shall help to solve. Anything more than an Xtal and an sdcard socket added to the nacked pic32mz chip shifts the design into an area which is already occupied by _very_ cheap XYZ x more powerful gadgets with _huge_ amount of active users..
My ambitions are to create board useful for other community members (if there would be interest), not looking at money or time. There are Linux boards as cheap as single PIC32MZ, so nobody sane could expect some groundbreaking success here or solving any problems. On the other hand, it is fun to play with and anybody can solder it at home, using simple components (no BGA and similar stuff) and accessible PCBs (something like 10-20 USD per 10 pieces). My only requirements would be the ability to add RAM for local compiling (even if it's 32/64MB that would get a significant amount of stuff built, and I could pay for/install the RAM module myself) and Ethernet (LAN8720 would be fine). With serial-to-USB chip as console port and LAN8720 it will be the best platform for LiteBSD development. I don't observe any issues with MZ-EF chip. I have only one such board, though (chipKIT Wi-Fire). I have tested four transceivers, namely LAN8720A, LAN8740A, IP101G and LAN9393. All these work fine. I would propose to install either LAN8720A or IP101G, as the latter promises less power consumption. This is a must have, as currently there is no USB bootloader available for MZ. It is possible to port the whole USB stack from NetBSD or from OpenBSD. It's a huge amount of work though. Good. Is it possible to provide a software-controllable SD power enable signal? It is required for restoring the SD card after data or prototol failure. Yes! Pito has a solution at user level. It's easy to put it into the kernel, so we will have a reliable date/time value. Excellent! We need some networked reference platform. Vybrid VF3xx MPUs with Cortex-A5 and 1.5 MB on-chip SRAM in LQFP176 package would be a perfect compact single-chip target for LiteBSD ARM port. - USB/serial converter hooked on USART. - LAN. For now I'm thinking of LAN8720A, because it is cheap and plentiful. IP101G may look interesting, but I'm having problems finding reliable supplier of this chip. - PCF8563 or similar I2C RTC, perhaps something like MCP79402. The latter one has unique EUI-64 MAC number on board, useful for networking. - Wi-fi. This would be cool and whatnot, but I'm not completely sure how much different is Wi-fi versus LAN from LiteBSD perspective. Could ESP8266 * be persuaded to serve as LiteBSD networking peripheral? What about the Wi-fi module on Wifire board? Once I'll be clear about Wi-fi, I'll collect all parts footprints and do feasibility study. Omitting USB host makes sense to me. Anything I could want USB for you can do with networking. Even if you don't populate the board with external RAM, the ability to very easily add external RAM would be a huge plus. Eventually, I want to be able to produce self-hosted binaries. I've seen a few offers of IP101G on AliExpress (1, 2, 3). Not sure though how reliable these guys are. LAN8720A is OK though. Actually we don't need an extra MAC, as every PIC32MZ comes with unique address preprogrammed in EMAC1SA0...EMAC1SA2 registers. It's OK for me. 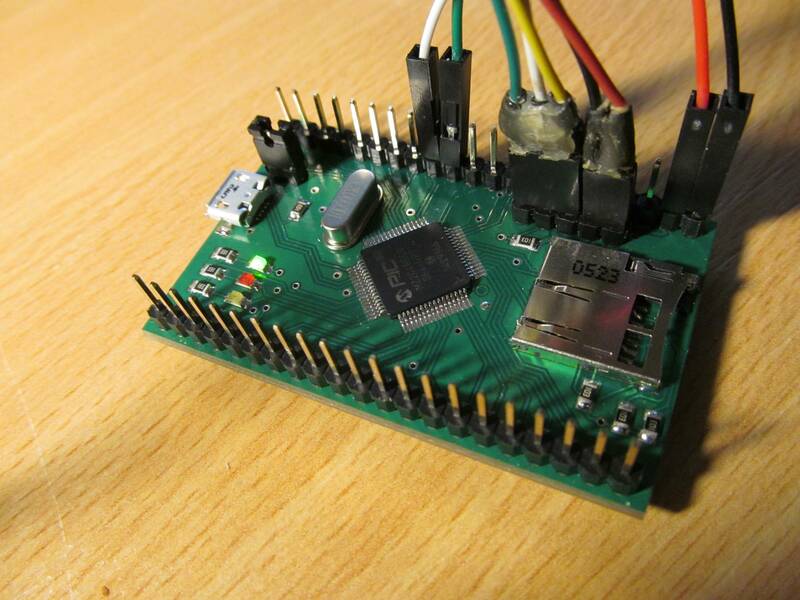 We can use other boards for USB development, like chipKIT Wi-Fire, Olimex HMZ144 and Whitecat. This would be a killer feature! I mean, ESP8266 in raw mode. AFAIK, people managed to develop a Linux driver for it (https://github.com/al177/esp8089) - so it's definitely possible. But may be it makes sense to create another board with ESP and without Ethernet. Not critical, as for me. ESP8266 in transparent mode is not what we need, but quote opposite. It's a possibility to transfer a byte stream untouched from one side to another. Looks like this year we will see a bunch of interesting processors and modules suitable for LiteBSD: Samsung Artik 1, Ingenic X1000 and M150, Microchip MZ-DA, Espressif ESP32, MediaTek LinkIt Smart 7688 and others.